Hi Friends: There is a new challenge today over at the Crafting When We Can Challenges Blog, where the current theme is Favorite Medium (pencils, pens, paint etc). Please visit our fabulous sponsor this week, Star Stampz, to see all of their wonderful products! My creation for this week is a Princess Birthday card. I printed the digital image onto smooth white cardstock, then fussy-cut her and colored her with LSG Magicals and Sprays (one of my favorite mediums - you know how I love the sparkle!) On a separate panel of watercolor paper, I used a flourish stencil and embossing paste to add a beautiful embossed image to the background. Then I colored the background with the same LSG Magicals and Sprays. 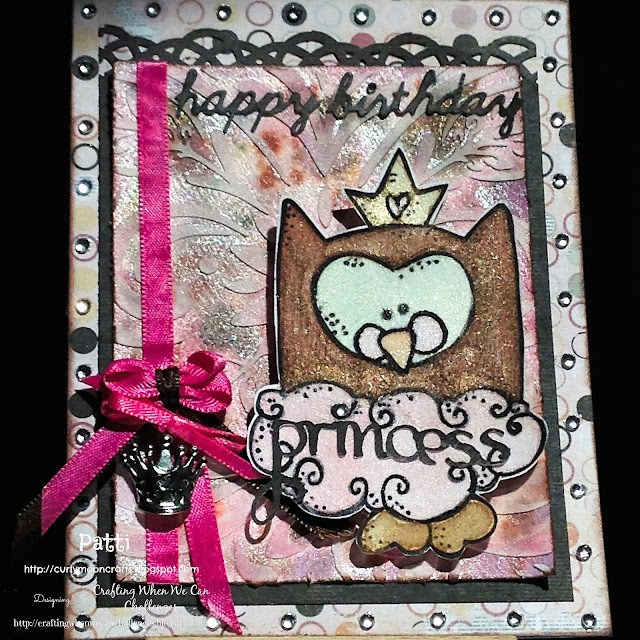 To create the card, I layered papers from the Prima Rondelle collection onto a blank A2 card. I used a border punch to decorate the top of the mat panel. I cut my words using the dies and Slice cartridge, then added them to the image and the colored panel. I added some ribbon and a princess crown charm to the watercolor panel and added it to the card. The bow was made using the fork technique - I have a whole stash of them that my daughter made because she was fascinated with the technique. I used some foam dots to pop the image up from the watercolor panel, then finished off with gems to dot the "i's" and add some more glimmer around the card.